Matt George and Ashleigh Dempster have been a power couple I've been following via social media for some time now. I know that sounds a tad creepy but if you're a serious lifestyle, culture and fashion junkie like I am who's obsessed with keeping abreast of what's in and what's to come then you totally understand. Their entrepreneur backgrounds has been nothing short of motivating and [kind of] obsessive. It's individuals like them that keep the ball rolling in the right direction when it comes to thinking outside the box and encouraging young individuals (myself included), to keep their creative minds going towards a goal(s) until successful. I came across AKID some time last year on Instagram with teaser photos courtesy of Matt George's account. The hype was beginning to build around the young brand with the help of wife, Ashleigh, when more undeniably cute teaser photos started appearing on AKID's actual Instagram account. Of course I started to follow. Being a young mother to a young boy with expensive taste (my fault, of course), I immediately hopped on the opportunity to reach out to both Matt and Ashleigh on their collaborated AKID Brand as it caught my attention fairly early. Their target audience is geared toward 'Fashion conscious parents and stylish kids,' so as a freelance journalist, stylist and blogger obsessed with fashion, lifestyle, culture and entertainment, I couldn't help but contact them as they're also young parents to two young boys (Jasper and Julian). I had the opportunity to interview the couple a few weeks ago before the official launch of the site, and we discussed the AKID Brand as a whole, their concept on the collection, their design inspirations, how both their backgrounds benefitted from starting AKID, and what to expect for the future. However, we have agreed not to release the exclusive interview as yet as additional visual content has yet to be added. Keep posted until next month! 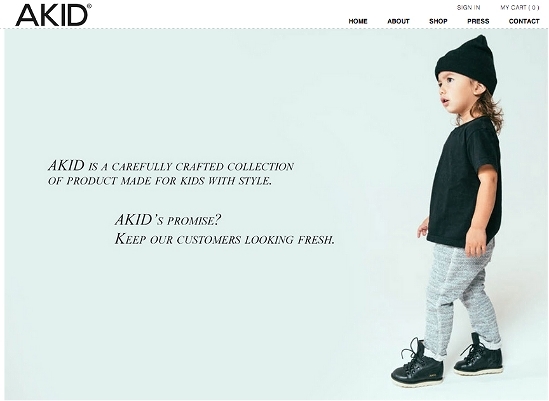 Till then, check out AKID, 'a carefully crafted collection of product made for kids with style' as they officially launched and went live Thursday, February 28.